Right, I gave everyone a rhyming name. Nam, our Native American Monitor. Cam, my 58 year old co-worker who has the stamina of a 25 year old. And Bam, the other Native American monitor who helped us out by driving us down the ridge, so that we didn't have to walk so far. While in Bam's truck and while on the trail, we had a lot of time to talk. Both Nam and Bam are christian. The Mono people where far enough away that they were not missionized by the Spanish, although they did have contact... many runaway indians fled to the mountains. But the Mono people were "christianized". When europeans did settle the foothills and the mountain area's, the indians lost there lands via bad trades, treaties, wars, kicked-out, etc, and the indian children were sent (no, forced) away to christian boarding schools, to "beat the savage" out of them, and to "modernize" them to make them socially acceptable. They were not allowed to speak their language, or practice their own religion, ceremonies, etc. (this is a sore spot for me, makes me mad). ANYWAY, Nam and Bam are the surviving second generation of this. Their parents where the kids sent to these boarding schools. Well, the Mono are a strong people obviously because the language has survived, although no one is fluent anymore, and most of the ceremonies and cultural ideals have survived and are remembered. The Mono (at least the ones I've met) have blended the two religions. They are Indian as well as christian. Bam is a very religious christain. He will not perform indian ceremonies, blessings, prayers, etc. but he will tell you or he will tell Nam that he (Nam) should perform a Mono blessing for this or that, because it needs to be done. Nam is the tribal chair of his tribe, so his perspective is different. He attends a christian church, and prays, etc. but he is also a strong believer in his own cultures beliefs. The first two days on the trail, Nam did not give any blessings to his ancestors. And to be honest, those where the two toughest days. We got lost a lot, trying to figure out our rhythm, who should do what, etc. On the third day, when he came upon a site (archaeological) he would give his blessing which consists of an offering of tobacco and a song (sung in Mono) to honor his ancestors (to acknowledge them and ask them for their blessing in return). While he was doing this Cam and I would watch quietly or be off looking at other things. This is a private thing between Nam and his ancestors. Every time I leave an indian archaeological site, I say Thank you. This is my way of acknowledging them. (My way of giving respect). Well, after we came upon one particular site, Nam gave his blessing... and he said they (his ancestors) told me to go look over there *he pointed up the hill a bit* So he goes off to explore, and Cam and I start recording the site. He starts whooping and hollering, and comes running down the hill and yells "I found the House Pits!!!! !, and there's midden, and more bedrock mortars, and..." What he ended up finding was an entire village site. If his ancestors didn't tell him to go look during his song, we would have never found it. So the joke after finding the village, was "hey Nam, stop talking to your ancestors... I don't want to have to record anymore villages" "stop finding features". It was all in fun, and we'd all laugh. Here are two more pictures from the trip. 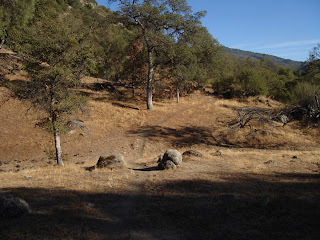 The first is of the trail. The second is a picture of what we archaeologists call a Bedrock Milling Feature. (BRM for short). 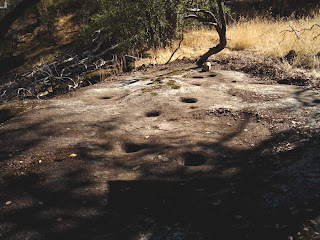 They are mortar holes where the indians would prepare acorns, pine seeds, and other nuts, berries, and grains.